—not just any used Steinway, but a genuine used Steinway piano. For Those Whose Desire for a Used Steinway Piano Is 100% Genuine. A Grand Guide to Buying a Used Steinway Piano is designed to assist you in your journey in selecting a genuine used Steinway piano—from learning about how a Steinway is built and rebuilt, to what makes a Steinway a genuine Steinway and what factors to consider when shopping the used-Steinway market. Every seller, piano dealer, and technician will classify a used Steinway piano in a different way; but, for the sake of this guide, we’ve broken it into seven simple categories. A used Steinway piano that has never been restored. Typically, the piano is not in playing condition, if it will play at all. The piano has been neglected, damaged or compromised, and has had no annual maintenance for an extended period of time. This is a Steinway that has had parts repaired over time without replacing any major components. The piano has been maintained and is still capable of being played daily, but major parts will likely need replacing in the near future. A rebuilt Steinway is a piano in which all the components have been rebuilt to its original condition. Some major components commonly rebuilt are the soundboard, bridges, and action parts, as well as the case. A Stein-Was is a used Steinway piano that has had one or more parts replaced with non-Steinway parts. Therefore, it was a Steinway piano; now it isn’t. An original used Steinway piano is one that has never had any parts replaced since it was manufactured. Typically, these are less than 20 years old. A Steinway piano that was restored by the Steinway Restoration Center in New York City and had the original parts replaced with genuine Steinway parts. the inner-rim and a Certificate of Authenticity. 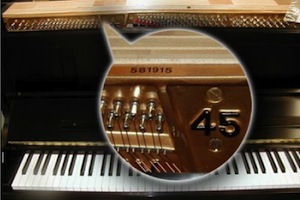 As new pianos are completed, they are serial-numbered consecutively and the number is applied to the cast-iron plate. cast-iron plate between the tuning pins above the keyboard. The serial number is located on top of the cast-iron plate when you open the toplid. Look up the serial number. 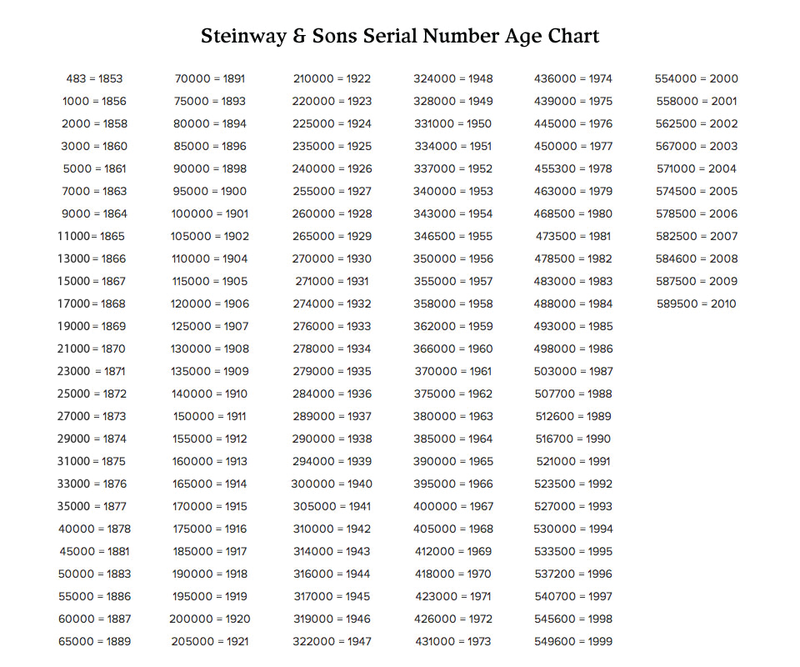 Now that you have the serial number, you can use the chart below to find out the year the piano was built. 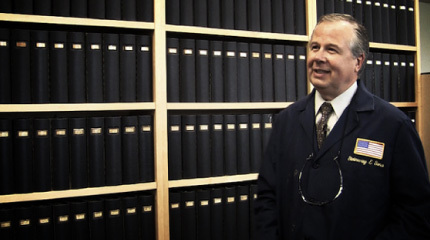 At the Steinway factory, there are several leather-bound log books that hold the records on every piano built by Steinway & Sons since 1853. As pianos are completed, they are serial-numbered and, even today, handwritten into the Steinway archives which list the details of every Steinway piano built. Anyone with a serial number from any Steinway piano can contact Steinway & Sons or their local Steinway dealer for the information on a specific Steinway, including the model, original finish, completion date, and the dealer to whom it was first shipped. The historical records of each and every piano built is just another one of the things that make a Steinway unique. Used, vintage, and restored Steinway pianos are often prized for their unique beauty and enduring value. However, for years, non-Steinway dealers and unauthorized piano rebuilders have created a great deal of confusion in the piano industry. 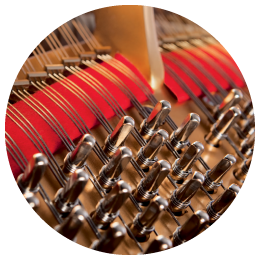 Many piano rebuilders use inferior non-Steinway parts, seriously compromising an instrument’s performance and investment value. For more than 160 years, Steinway & Sons has been on a continuing quest to improve the Steinway piano. Continuous improvement means finding the perfect balance of the many thousands of parts which make up a Steinway piano. 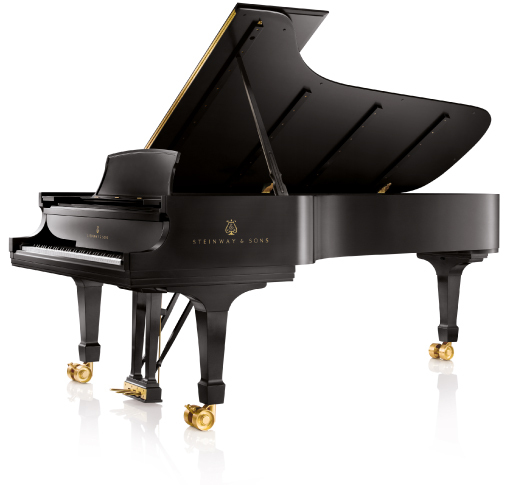 When a Steinway piano is rebuilt, it is imperative that Steinway parts be used in this process if the piano is to play and sound as a Steinway should play and sound. 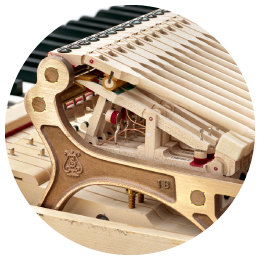 A Steinway piano is designed to use genuine Steinway parts, and it performs its best when these parts are used. If the parts are not 100% Steinway, then the piano is not 100% Steinway and its performance and investment value will be compromised. Non-Steinway replacement parts used in the rebuilding of a Steinway piano are purchased for one reason only: They are cheaper, both in price and quality. There is no other reason. a Steinway Model O (5’10”) grand piano. The price of a rebuilt Steinway piano with non-Steinway parts should cost significantly less than one with 100% genuine Steinway parts. Most people selling a used Steinway with non-Steinway parts will NOT advertise it as a counterfeit or Stein-Was, so it’s always best to ask. If you read only one section of this guide, read this section. The soundboard lies at the heart of a Steinway grand or upright piano, which is why Steinway & Sons takes great care in its design and in the selection of the wood used. The soundboard is a critical component in producing the inimitable “Steinway Sound” you desire. of the soundboard. When combined with the soundboard being gradually tapered from the center to the edge, which permits the freedom of movement, it creates a sound of unparalleled richness, sonority, and sustain. the spruce planks to make their soundboards. 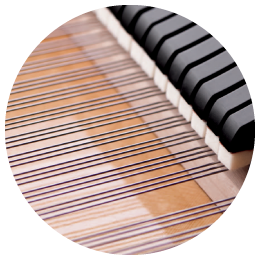 Steinway’s strict standards for soundboard spruce and their yield factor on the prime-grade planks they purchase is only 50%. 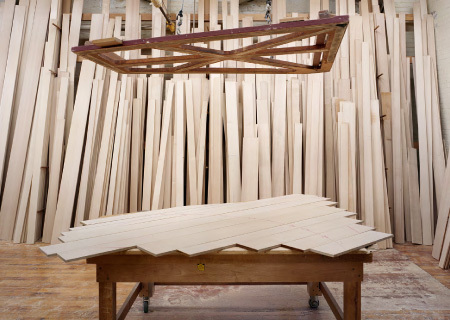 Meaning, of all the spruce that Steinway inspects and purchases, only 50% of that spruce goes into the making their soundboards. This allows Steinway to build each soundboard to their standards, not the lumber supplier’s. 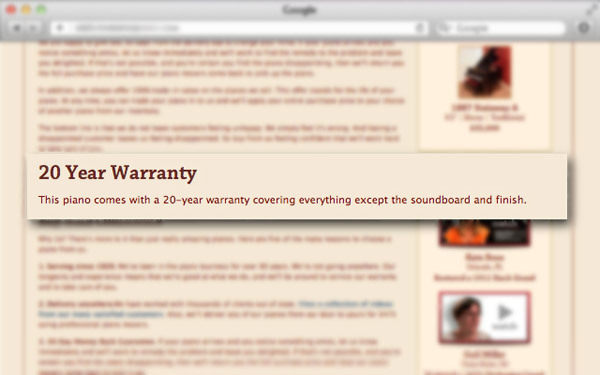 Steinway NEVER sells its soundboards. Steinway sells their soundboards to no one, since the skill, expertise and machinery necessary to replace a soundboard is only available at the Steinway factory. So if a used Steinway was restored somewhere other than the Steinway Restoration Center, it may still have the Steinway & Sons trademark logo on it, but if it doesn’t have a genuine Steinway & Sons soundboard, it has lost the internal magic that makes it a Steinway. If the soundboard was replaced, how do I know if it was replaced by Steinway & Sons? Determining if the soundboard was replaced by Steinway & Sons can be difficult to the untrained eye. It’s highly recommended that you ask the rebuilder or seller for documents that include the serial number and state that the soundboard was replaced with a genuine Steinway soundboard at the Steinway Restoration Center. Imagine if a Stradivarius violin had the back wood panel replaced by another wood panel not produced by Stradivarius. Would it still sound like a Stradivarius? Would it play like a Stradivarius? Would it still be a Stradivarius? Would the value be the same as Stradivarius? Most certainly not, and the same is true of the Steinway soundboard. A number of piano rebuilders out there are trying to make good soundboards for Steinway grands. One of their difficulties is the necessity they face of reverse-engineering and guesswork. In the two previous sections, we’ve covered the importance of making sure the used Steinway you purchase is in fact a genuine Steinway. But how can you be sure you are investing in a genuine Steinway piano? in writing, from the seller, a statement verifying that the piano has 100% genuine Steinway parts and that it can be proven. If the seller doesn’t have a statement with their signature you can download the Declaration of Steinway Parts Authenticity Certificate (PDF). Present this certificate to any seller or rebuilder of a rebuilt Steinway piano and request that they fill it out and sign it to ensure that the piano has genuine Steinway parts. work, and what benefits they provide for pianists like yourself. The touch of a Steinway is the most sensitive and responsive of any piano made. This is not merely an opinion. It is a fact that results from the way the piano is designed and manufactured. In fact, tests have proven that the keys on a Steinway piano can repeat 14% more quickly than the keys of any other piano. Steinway & Sons soundboard is based on a 1936 patent to achieve optimum performance in dynamic range, and maximum sustain. Under this patent, the soundboard is gradually tapered from the center to the edge, permitting freedom of movement and creating a sound of unparalleled richness, sonority, and sustain. 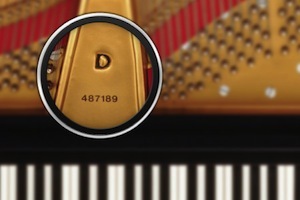 Due to the unique design of the Steinway pinblock all Steinway pianos hold their tune longer. The secret lies in the grain of the wood. The grain of each layer is positioned at 45 degrees to the grain in the next layer. As a result, the tuning pins are exposed on all sides to the tenacious grip of the maple’s end grain. The tighter the grip on the tuning pins, the longer the piano stays in tune. There are rebuilders, technicians, and non-Steinway dealers who will claim that Steinway pianos built during the “Golden Age” are the best Steinway pianos ever built. This is a myth that has been around since Steinway started building pianos. Are older Steinway pianos really better than new ones? 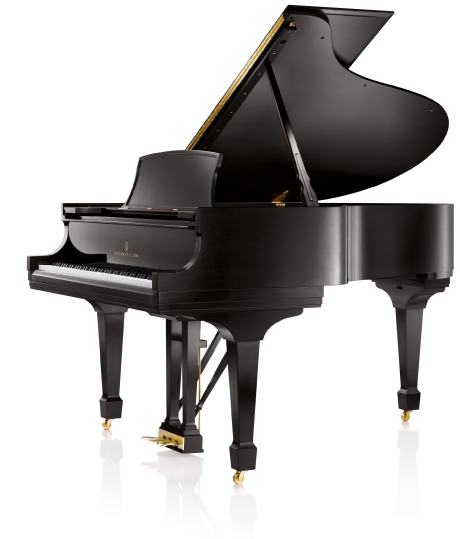 There are very few piano dealers that are authorized to sell new Steinway pianos throughout the world (only about 68 in North America) but many piano dealers who can acquire pre-owned Steinway pianos to resell. Since they can’t sell new Steinway pianos, it is to their benefit to advertise that their used Steinway from the “Golden Age” is more desirable than a new one. The myth of the “Golden Age” is easily disproved. Just look at the concert halls throughout the world who cater to the most discriminating pianists of our time. How old are the pianos you are hearing? On average, they are less than 10 years old. If the world’s most prominent pianists felt that pianos from a “Golden Age” were superior to those produced today, we would not see new Steinway pianos on these stages. A Steinway piano is built to be rebuilt. 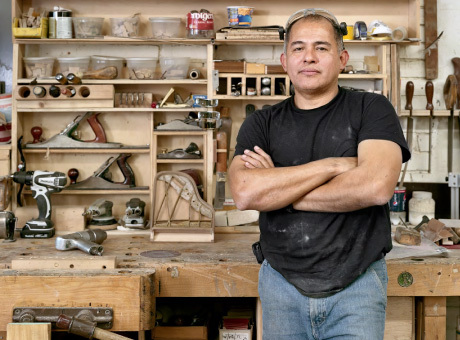 There are hundreds of companies and technicians who rebuild Steinway pianos. However, there is only one piano rebuilder in the world who is authorized by Steinway & Sons to restore Steinway pianos: the Steinway Restoration Center which operates out of the Steinway New York factory and the Steinway Hamburg factory. A piano restored by the Restoration Center is the closest piano possible to a brand-new Steinway. 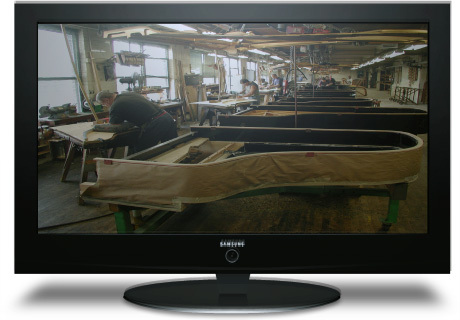 The Steinway Restoration Center is the only authorized Steinway piano rebuilder in the world. 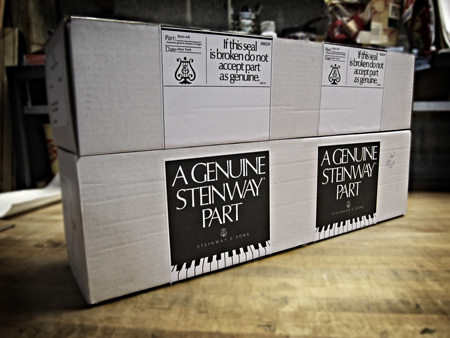 Each and every Steinway piano restored receives a Certificate of Authenticity which guarantees the piano was restored using genuine Steinway parts. Steinway pianos restored at the Restoration Center carry a 5-year Steinway warranty—the same as a brand-new Steinway. No one else has all the original designs, specifications and necessary equipment. Who better to restore a vintage Steinway piano than the craftsmen who built it? Since 1853, Steinway & Sons has built over 600,000 new Steinway pianos and they are the world’s largest rebuilder of Steinway pianos. Simply put, no one knows a Steinway like Steinway. Average number of months it takes the Restoration Center to restore a Steinway grand piano. The Steinway Restoration Center restores more than 200 Steinway pianos a year. 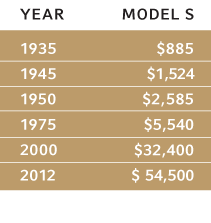 The average age of a Steinway piano restored by the Steinway Restoration Center. Ella Morton, from Rocketboom, visits with Bill Youse, Director of Technical Services & Special Projects for Steinway & Sons to discuss how vintage Steinway pianos are restored to their original splendor at the Steinway Restoration Center. For more than 165 years, authentic Steinways have had an unrivaled record within the piano world for maintaining their value. 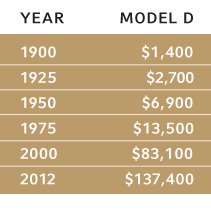 Over a span of decades, properly cared-for Steinways regularly increase in value – often well beyond the original purchase price. The best time to invest in a Steinway piano is always the same: TODAY. That’s because when factory prices of new Steinway pianos increase, the value of used Steinway pianos also rise. The following is a historical listing of prices. It is said that if you don’t know your jewels, know your jeweler. The same is true for pianos—it’s always best to rely on a reputable piano dealer or piano rebuilder. 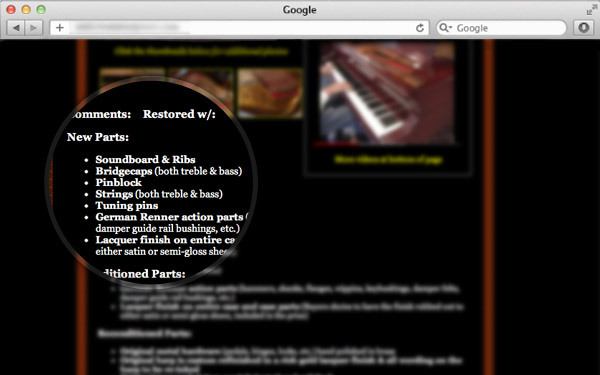 Below are a few examples of details you should be looking for when shopping on-line for a pre-owned Steinway piano. When shopping for a used Steinway make sure to ask if there is a warranty, and if there is, what is covered under the warranty. In the example on the left the piano has a 20-year warranty but it doesn’t cover the ever-so-important soundboard at all. There should only be one price for a used product: The price to buy it. Some people will list several prices with unclear verbiage in an effort to confuse the consumer. 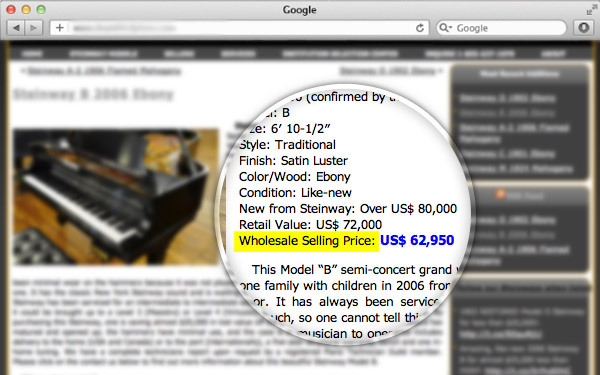 In this example, the seller uses the word “wholesale” instead of the word “retail”. What else might they mislead you on? Often times a piano technician or rebuilder will use the words “Certified” and “Steinway” together to make it seem as if Steinway approves their work. This is false. 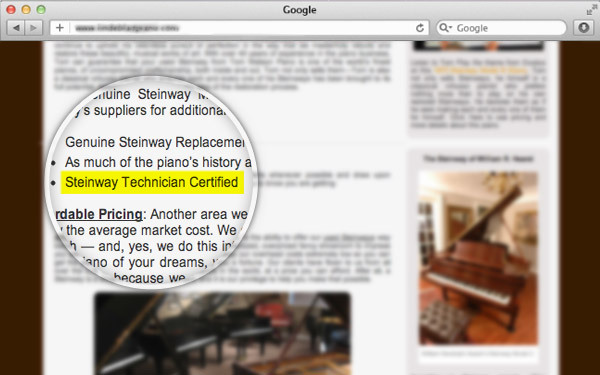 Per Steinway & Sons, the only “Certified Steinway Technicians” are the ones that they employ. If you are looking at a rebuilt Steinway piano it is important to find out what parts have been replaced and if they were replaced with genuine Steinway parts. In this example, it says a new soundboard was installed. If the new soundboard was not replaced at the Steinway factory then this piano is no longer a Steinway. There is a Steinway piano for everyone; you just have to find your Steinway. Play a new Steinway piano. You may have already made your mind up that purchasing a used Steinway piano is the right choice for you. However, you would be doing your due diligence to visit your local Steinway dealer and play a couple of new Steinway pianos. This experience will give you something to compare against as you shop for a used Steinway piano. “Note by Note” is a feature-length independent documentary that follows the creation of a Steinway concert grand, #L1037—from the forest floor to concert hall. 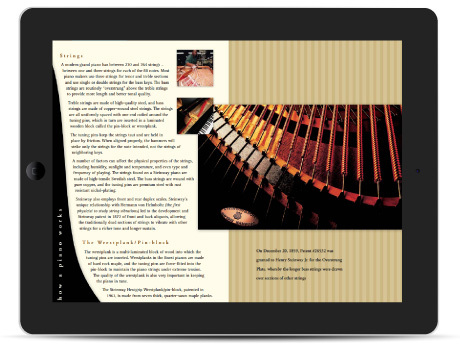 It explores the relationship between musician and instrument, chronicles the manufacturing process, and illustrates what makes each Steinway unique in this age of mass production. Steinway & Sons has a factory in Long Island City, New York, and one in Hamburg, Germany, that build Steinway upright and grand pianos. Each factory offers a 3-hour tour to the public during the week. What better way to learn about Steinway pianos than to see first-hand how they are built? 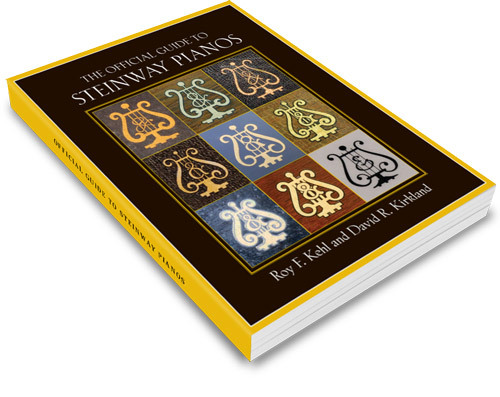 A compilation of thirty years of research, by authors Roy F. Kehl and David R. Kirkland, that offers a thorough and accurate production history of Steinway pianos. 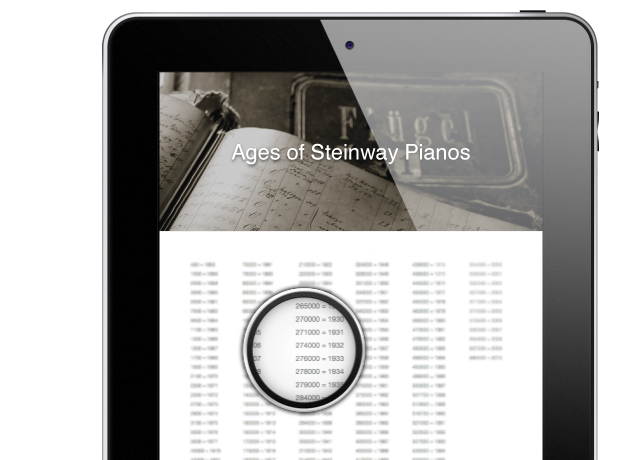 In this guide you will find the complete list of Steinway patents, Steinway models—past and present—with production dates and serial numbers, and the characteristic detail changes. Receive your free copy of the Piano Buyer’s Guide. Choosing the right piano can be a very pleasant and rewarding experience for an informed buyer. This guide will assist you in educating yourself on how to select the right piano—based on your specific needs. A special thank-you to everyone at Steinway & Sons who shared their knowledge of Steinway pianos with us for this Guide. © 2012 usedsteinwaypiano.com. All Rights Reserved.